Southwark has a housing crisis. Lots of people don’t have homes. Lots of children don’t have very nice ones. The council sees the Arch as a bit of prime solution to this problem. It plans to build homes instead of Arch. There will still be a crossing and a right of way after the work is completed but in the meantime there may be a building site. The council promises to tell us before it happens but between the very important person who makes the promise and the very unimportant guy who puts up the barriers there are probably about 20 layers of management and it’s best to Be Prepared. I may have said that before. The solution, reasonably obviously is to go around the arch. If this occurs on your way to work, do not panic. Turn left and then right before the traffic lights — this should be Melon Street. This map http://cycle.travel/map/journey/51919 shows how to find Melon Street, turn right at the end and re-join the canal path. Happiness. This map http://cycle.travel/map/journey/51921 is for the bloody, bold and resolute (Macbeth). It shows the fast alternative to the canal path, mixing it with motors but not mixing it with pedestrians, shopping trolleys, dogs, toddlers, mud and autumn leaves. The choice is yours. Obviously you can also go right in front of the arch, turn left and then turn left again. 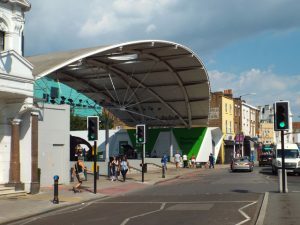 You find yourself back in Peckham Square with all the options that you would have had if you went through the Arch. I can’t show you a map because the mapping tool won’t make one. I think it thinks there is a building in the way. There isn’t. I hope this information isn’t useful for a long time.